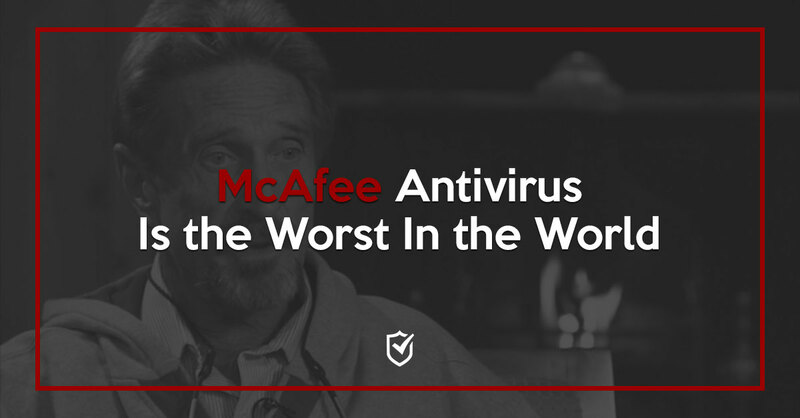 The US-based McAfee Antivirus company created and developed by cyber-security pioneer John McAfee is one of the most popular Antivirus software in the world. The company which was acquired by Intel back in 2011 for over $7 billion dollars was first established by John McAfee, who later left the company back in 1994 to pursue other projects. Intel CEO Brian Krzanich stated In Jan 2014 that the Intel company who owns the McAfee software has decided to change the Antivirus name from McAfee Security to Intel Security. Former founder John McAfee has expressed great pleasure and happiness for this decision. “I am now everlastingly grateful to Intel for freeing me from this terrible association with the worst software on the planet. These are not my words, but the words of millions of enraged users” John McAfee to BBC. The answer above found in a Reddit AMA by John McAfee was for a question of one of the Redditors who asked Mr. McAfee how he didn’t burst out laughing while shooting the video titled ”How to Uninstall McAfee Antivirus”, the video was filmed back in 2013, and since then it has accumulated over 7.5 million views on YouTube. It sounds unreal that he actually said that in such a bothersome way, considering the fact that John McAfee was the founder and the original creator and developer of the antivirus, it’s also rumored that he actually wrote the original code of the antivirus in less than 2 hours! The Antivirus software, commonly known as the world’s first ever computer antivirus, comes pre-installed on users computers who feel often tend to feel extremely frustrated by the slow, irritating, and annoying nature of the Antivirus. That is also extremely difficult to remove from most computers. All of these problems have caused most users around the world to associate this negativity, anger, and disappointment with the public figure of John McAfee. The original founder of the Antivirus who left the company for over 20 years now was truly happy and satisfied when Intel decided to change the software’ name. The cyber-security expert who is now involved in the blockchain and cryptocurrency space is known for his unconventional and unexpected responses. The tech pioneer who lost most of his net worth in the 2007 stock market crash is also known for his brutal honesty and wittiness especially when replying to his fans on the social networking site Twitter. It should also be noted that the reason he created the above explicit video is due to countless people who tend to send him mad emails about the McAfee Antivirus thinking he’s still in charge of the company. The man certainly has many haters and lovers, but he is often times considered politically correct when asked about his opinion of things even if it means bashing his own creation, I guess we can all agree that he doesn’t shy away of being called insanely crazy and hilarious.